After initial FileNet investments and with the economic downturns in 2002 and 2008, many clients have historically chosen to avoid updating their image management systems and are still running on Legacy versions of FileNet software and hardware. Technology Services Group (TSG) began working with one legacy FileNet customer in the summer of 2016. 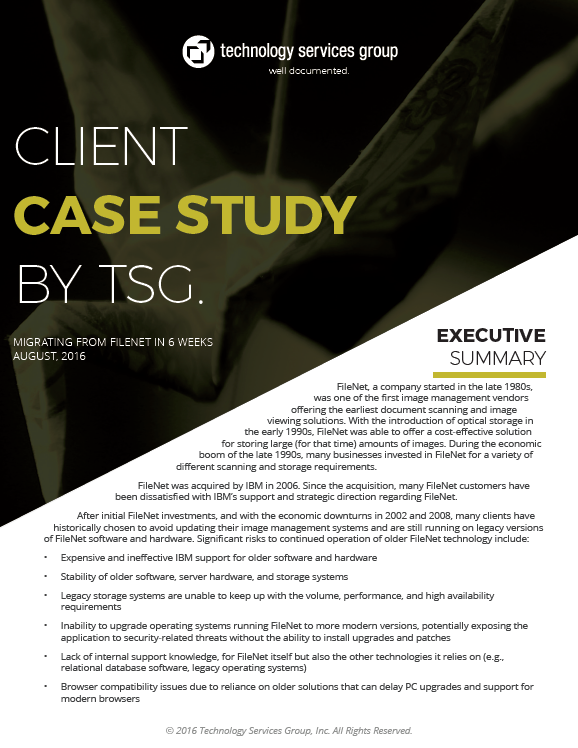 Bringing both products and consultant experience to the project, TSG was able to migrate the client’s FileNet implementation to a modern ECM system in 6 weeks. This case study presents practical approaches and observations in regards to how the client was able to move so quickly.